Last year’s Summer Event was fantastic and players could work toward earning the fastest ship in Star Trek Online: the Risian Corvette. This year is no different; we have another unique and powerful ship to give away to players who complete the Event Reputation project for the Risian Luxury Cruiser. This new starship is even more customizable than the Risian Corvette. The Risian Luxury Cruiser was originally designed as a luxury cruise liner. The ship's incredible agility for a ship of its size and class drew the attention of the Lobi Crystal Consortium, who purchased the rights to manufacture armed versions of the vessel. This truly extravagant starship has caused ludicrously wealthy buyers to line up at the opportunity to acquire one. The Risian Luxury Cruiser is quite agile for a ship within the Cruiser class. Despite its agility, it sacrifices little durability. This starship features a Soliton Wave Generator universal console which can draw nearby enemies toward it before unleashing a devastating Soliton Wave upon foes caught within its blast radius. Risian Luxury Cruisers can be equipped with a Soliton Wave Generator. This allows the ship to generate a powerful, but stable, Soliton wave that will draw nearby enemy ships toward the Cruiser and deal minor radiation damage. During this time, the Soliton Wave Generator is building up a powerful charge that is released after a short time. 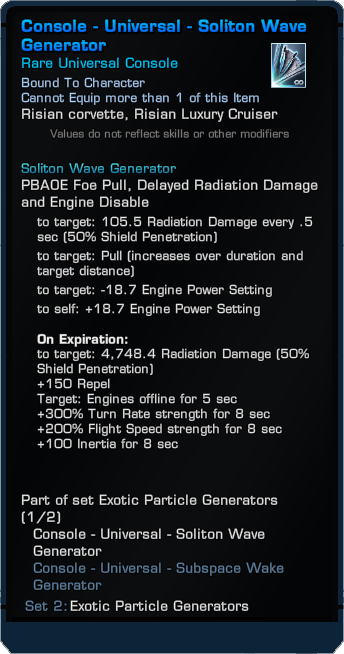 This released Soliton Wave will damage nearby foes and will briefly knock their engines offline. This Console Mod can only be equipped on Risian starships, but can be fit in any console slot. You may only equip one of these mods on any single ship. NOTE: The above stats are subject to change. The box that the ship comes in, which cannot be opened until the minimum rank listed above, is bound upon pickup. Once unpacked, this ship cannot be reclaimed if dismissed. We hope you love the new events on Risa and enjoy the Lohlunat Festival! See you in game.